As an online digital marketing agency, we understand the needs of our customers and always strive to deliver high quality services. 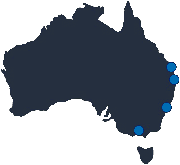 We have been serving clients in Sydney, Brisbane, Melbourne, on the Gold Coast, Sunshine Coast, and throughout Australia since 1995. As an innovative digital marketing company, we provide a wide range of services including website design, web development, domain name registration, ecommerce and shopping cart systems, multi-lingual (multi language) websites, mobile and tablet friendly sites, hosting solutions, managed VPS hosting, search engine optimisation (SEO), Google Adwords, email marketing, social media marketing, and more. Your identity is your brand and your customers will recognise your brand and associate it with your business. High quality website design and development to present your business online to your potential customers. Through search engine optimisation and Google Adwords, get your website seen by your targetted audience. Sell your products online with a product catalogue and shopping cart system on your website. Quality Australian web hosting to deliver fast speeds and high reliability for your website on the Internet. When you need something specific created and customised to your requirements. We will work together with you to find out what your company needs in a website as well as what your customers and potential customers want to see in your website. Every website that we design and build is unique and not based on a template. This is very important as your website needs to stand out from your competitors for yours to be noticed. It also means that our design team is not restricted by the limitations of a template. You know your business and you know your customers. And we know websites and marketing. So by working together with your company, we can assist you to get the website and marketing strategy that your company deserves.